Your Self-Image. How do you see yourself? Do you picture yourself as shy or outgoing, inept or capable, loving or distant? The opinion you have about yourself, your self-image, is probably the most important opinion you have. It’s what governs how you act, what you do, and how you think. The picture you have of yourself is firmly rooted in your subconscious. It’s been formed from your experience and parental conditioning, and you may not even be aware of it. It’s positive and beneficial, or cumbersome and detrimental. If fear, anxiety, or lack of confidence are part of your picture, they’re probably getting in the way of who you’d like to be. 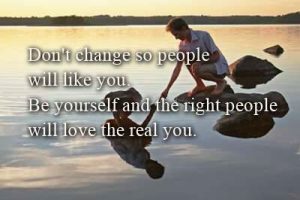 When you change your self-image, you change your personality and behavior. Anything you’ve learned from the past can be changed. And when you learn to hold a new image of yourself, you’ll actually be a new person. I am a warm, friendly person, interested in other people. I am an energetic, sparkling, and enthusiastic person, fascinated by everything I do. I am a leader and enjoy talking to groups, always in good humor. I am successful in whatever I set my mind to do. I enjoy my work thoroughly; I look forward to going to work every day. I am completely at ease with people at social gatherings. I live by, and support, the highest standards of my profession. I like myself and enjoy life to the fullest. I am in good health, with success, and achievement. I am much more concerned with what I think of myself than what I might imagine others think of me. When you practice, focus on only one aspect of your self-image at a time. Once you’re deeply relaxed, see yourself in that regard as you would like to be — imagine that you are that way. Soon, you won’t need to imagine it. Imagine yourself feeling the way you do after a very rewarding physical activity, such as running, tennis, swimming, or dancing — actually feel the physical sense of well-being. Visualize your favorite animal playing or relaxing on a clear day — feel the carefree happiness of playing and the peaceful, not-a-care-in-the-world relaxation. Visualize the bottom of your file basket or inbox as empty, and feel the sense of completion. Imagine you are tasting your favorite fruit or experiencing your favorite scent. Savor the taste or scent and feel yourself relax. Visualize your favorite color and let it spread throughout your body and mind. Feel the wave of pleasant relaxation. Tune in with your mind’s ear to your favorite piece of music and feel the soothing wave of peace and relaxation. Let your mind’s eye take you to a place where you feel safe, secure, serene, and happy — your personal, private paradise. Feel better already, don’t you?